Think of Krakow, Poland, and your mind may be filled with conflicting images: The country's transformation in the 21st century, its centuries-old architecture, the horrors of the Holocaust and years behind the iron curtain after Poland was liberated by the Soviet Army in World War II. These conflicting images fuse into the reality of modern Krakow, a city on the mend from decades of difficulties that started with the invasion of Poland by Nazi Germany in 1939 and began to recede in 1989 with the fall of communism in Poland. 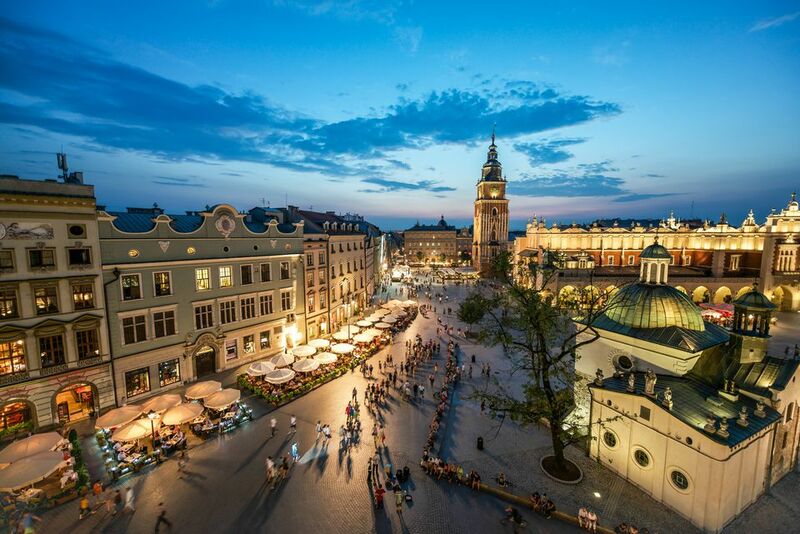 Krakow honors its past even as it looks forward to a future of renewal. April, in particular, is a great time to visit this Polish city. Temperatures are on the rise, making it a wonderful month to take in the city's sights and attractions, especially its notable architecture, which includes Baroque, Renaissance, and Gothic buildings. If you're planning a trip to Krakow in April, you'll find relatively mild weather throughout the month. Timing is important in April, though. Springtime temperatures take a big jump from the start to the end of the month, from an average high of 52 degrees Fahrenheit (11 degrees Celsius) at the beginning to 64 degrees Fahrenheit (17 degrees Celsius) right as the month comes to a close. It's chilly at night, ranging from lows of 35 degrees Fahrenheit to 44 degrees Fahrenheit right at the end of the month. Besides a big hike in the high temperatures, Krakow gets a big bounce in daylight hours, adding 1.75 hours of light by the end of the month. You'll also see an average of 4.5 hours of sunlight per day. It's typically sunniest in the early mornings and mid-day. April doesn't receive an excessive amount of rain and most of it is spread out across the month, so rain isn't likely to affect your trip. On average, the city sees 1.5 inches of precipitation falling over 15 days in April. If the temperature falls low enough, a light dusting of snow is possible, but it's not common. The daily high-temperature range in April dictates taking along pieces that can be layered and stripped off as needed or used alone on particularly warm days. Take jeans or cotton pants and lightweight sweaters that give some warmth—cashmere is a good choice since it takes little room in your bag. Cotton sweaters are also good in this kind of weather. Add a few long-sleeve tops or shirts that harmonize color-wise with the sweaters so that you can wear them together or separately. Take a cotton or wool blazer or leather jacket for night time when it's cooler or if you experience an especially cold day. Ankle boots are great for walking around old cities with uneven pavement, and they are the perfect amount of warmth for this temperature range. Or wear other sturdy shoes that are completely closed with socks. Easter in Krakow—and its surrounding holidays—is the focus in the month of April. If ​Easter falls in April, the Krakow Easter market is a must for travelers. Celebrating Easter in Krakow is a memorable, colorful, and meaningful experience. Pisanki, or painted Easter eggs, are one of the hallmarks of the holiday. Rekawka: This Polish Easter celebration is observed on Tuesday after formal Easter holidays. Traditionally, the day was celebrated with sword and ax fights to honor the memory of the deceased. Good Friday: This is a very popular holiday for Polish people. On this date, which takes place in mid-April, you'll see black cloth used to cover the cross and other religious artifacts. Misteria Paschalia Festival: This classical and historical music concert is held in various venues in Krakow throughout Holy Week. If that occurs in April, it's a must ticket. There are two performances nightly of different programs, so there is a great amount of choice of both time and music. From Wawel Castle to the Main Market Square, Krakow blooms with the energy of springtime in April. Try to see as many of the sights as you can on foot—you'll get a better feel for the city and make some discoveries along the way. Other must-sees in Krakow include the Rynek Underground and Schindler's Factory (yes, that Schindler, made famous in the 1993 Steven Spielberg movie Schindler's List.) As you walk to visit these places or to meals or cafes you'll be in the presence of one of Krakow's main attractions—its architecture. Don't forget to look around and up.